In today’s blog I will go over the steps for performing a hypothesis test for a single population mean using StatCrunch. Although I will be explaining the p-value approach to these tests, you could also use StatCrunch for a classical hypothesis test. I will be focusing on both the z-test and the t-test for a single population mean. Consult your instructor, class notes, and/or textbook for the conditions for determining when to use a z-test and when to use a t-test. If you want to perform a z-test and already know the sample mean, sample standard deviation, and sample size, click the “Stat” button in StatCrunch and select “Z statistics” > “One sample” > “with summary” from the menu list. When the dialog box opens, input the sample mean, sample standard deviation, and sample size in the appropriate boxes. Click the “Next” button to go to the second screen. Here you need to determine the inequality sign for the alternate hypothesis as well as the claimed value of . Click on the “Calculate” button to display the results. Here is the output box showing the results for testing versus with a sample mean of 57, a sample standard deviation of 6.2, and a sample size of 123. 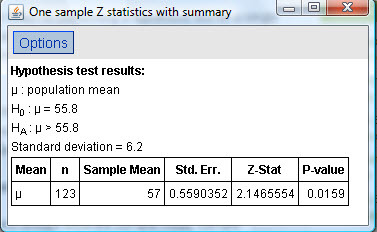 In addition to calculating the Z-Statistic, StatCrunch provides you with the p-value for the test. Here the p-value is 0.0159. Here is how the hypothesis test would be written at . Reject if p-value < 0.05. There is significant evidence to support . If you have sample data to work with, begin by typing it in one column in the StatCrunch spreadsheet. (Sample data can be copied and pasted into StatCrunch from other programs.) To perform the test, start with the “Stat” button and select “Z statistics” > “One sample” > “with data” from the menu list. On the first screen of the dialog box you bill be prompted for the column containing the data, as well as the population standard deviation. On the second screen, enter the inequality for the alternate hypothesis as well as the claimed value of and click the “Calculate” button. The output is displayed in the same fashion as the test “with summary” as shown above. If you need to perform a t-test, use the “T statistics” button. The test “with summary” is exactly as it is described above for the z-test. The test “with data” is the same as the z-test above, except you will not need to enter the (unknown) population standard deviation. I hope that you find this useful. In future blogs I will explain how to use StatCrunch to perform proportion tests, 2-sample tests, chi-square tests, ANOVA, and paired sample tests. If you have any StatCrunch or statistical questions, you can reach me through the contact page on my website . I am a mathematics instructor at College of the Sequoias in Visalia, CA. Each Friday I will blog about technology, inside and outside of the classroom. Let me know if there are other topics you’d like me to cover by leaving a comment or by reaching me through the contact page on my website: georgewoodbury.com. Entry filed under: Math, StatCrunch, statistics, technology. Tags: alternate hypothesis, announcement manager, college, decision rule, education, george woodbury, h0, h1, ha, ho, hypothesis test, level of significance, Math, math study skills, mu, null hypothesis, one mean test, p value, p value approach, Pearson Education, population, sample, StatCrunch, statistics, stats, teaching, technology, test statistic, woodbury. hi you seem very knowledgeable about statcrunch. i am trying to put data in to perform a hypothesis test but i am having trouble putting it in. do you think you could help?